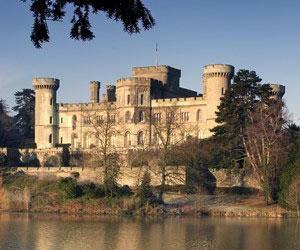 Wedding Ceremonies & Receptions at Eastnor Castle01531 633160work Wedding Ceremony VenueEastnor is a dramatic, fairytale castle situated in a 5000-acre estate in the Malvern Hills within an Area of Outstanding Natural Beauty. The castle is surrounded by a lake, deer park and arboretum, with magnificent views of the rolling Herefordshire countryside. Despite its spectacular rural location, Eastnor Castle is only ten minutes from the national motorway network and only two and a half hours by car from central London. We have a licence to hold civil wedding ceremonies in the Gothic Drawing Room. This richly decorated room, designed by Augustus Pugin, is a perfect, romantic setting for the wedding itself. The room is licenced for a maximum of 80 guests. The Great Hall, with its sixty foot high ceiling and roaring log fires in winter months, is an imposing yet intimate space for your drinks reception, and conveniently connects to the Octagon Saloon with French windows onto the terrace lawns. In summer months, we serve drinks here, overlooking the lake which is often accompanied by a string quartet or small jazz band. Good food is an important part of any wedding, and we are proud of the exceptionally high standard and wide variety of menus that are designed to cater for a range of tastes. The best fresh local produce is used wherever possible, and, if our menus are not entirely suitable, we will try to create an individual menu on request. Our wine list has been carefully selected to offer good quality, easy-drinking wines at sensible prices. The State Dining Room will seat up to 80 guests at round tables for a served or buffet-style meal. For larger weddings, the Great Hall will seat up to 150 guests on round tables. There are twelve beautiful guest bedrooms in the Castle that are available for the bride and groom and their family and close friends. Each of the luxurious bedrooms is individual in style and character, containing original works of art from the family collection, and all have stunning views of the lake, grounds or Malvern Hills. We offer the very highest levels of service and comfort and because we only operate on an exclusive-use basis, you will feel very much at home in these beautiful surroundings. We have built our excellent reputation through a flexible and enthusiastic approach to our business, and our guests always comment on how friendly and helpful they find our staff. Our outstanding facilities and service provide an exceptional venue for your wedding, and our experienced and friendly staff will ensure that everything runs smoothly. We will help co-ordinate your plans, recommend excellent suppliers and suggest exciting and innovative touches that will enhance your wedding day. We pride ourselves on the highest standards of comfort, impeccable service and personal attention to details, and you and your guests will enjoy a warm and relaxed atmosphere in this truly exceptional family home. You will find tranquillity, splendour and complete exclusivity at Eastnor Castle, and whatever you are planning, we will enjoy the challenge of exceeding your expectations. St John the Baptist Church in the village of Eastnor can be used for wedding ceremonies too, this can hold a maximum of 150 guests. Eastnor is a dramatic, fairytale castle situated in a 5000-acre estate in the Malvern Hills within an Area of Outstanding Natural Beauty. The castle is surrounded by a lake, deer park and arboretum, with magnificent views of the rolling Herefordshire countryside. Despite its spectacular rural location, Eastnor Castle is only ten minutes from the national motorway network and only two and a half hours by car from central London. Two miles east of Ledbury on the A438 Tewksbury Road only ten minutes from junction 2 of M50.